(Newser) – Keeping your drunkenness a secret from your Uber driver might be impossible in a future world, no matter how much silence emanates from the backseat. A patent application shows that Uber may be interested in trying to figure out whether potential passengers are drunk by analyzing everything from typos in the ride request to whether the phone was swaying, reports the Guardian. 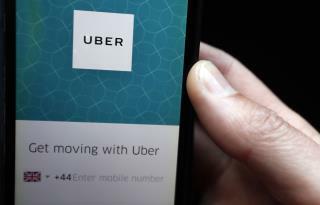 While it's only theoretical at this point, the idea is that certain behavior would trigger a reaction from Uber if it differs from behavior during past ride requests, reports the Washington Post. For example, a specially trained driver might arrive to transport a drunk passenger and make sure the person is dropped off in a safe spot. The app might also keep a drunk passenger from pooling with other riders. "Experts also fear the technology could.... keep users from hailing a ride when drunk or high" Uhh no. Drunk people needing rides is the reason for their success. That's their bread and butter. Ok, have the bartender/bouncer/cook type in your request. That said, WTF does Uber expect? Sober people don't require their services.